You are here: Home / Email Protection / Is User Training the Weakest Link in Your Email Security Strategy? End users are the recipients of messages with links to spoofed domains that attempt to steal their credentials in order to launch internal attacks. They’re also the lucky recipients of various social engineering attacks, including often convincing attempts that end with a wire transfer to criminals. Unfortunately, these are attacks that your traditional email security technologies just won’t defend against. But are humans the weakest link? 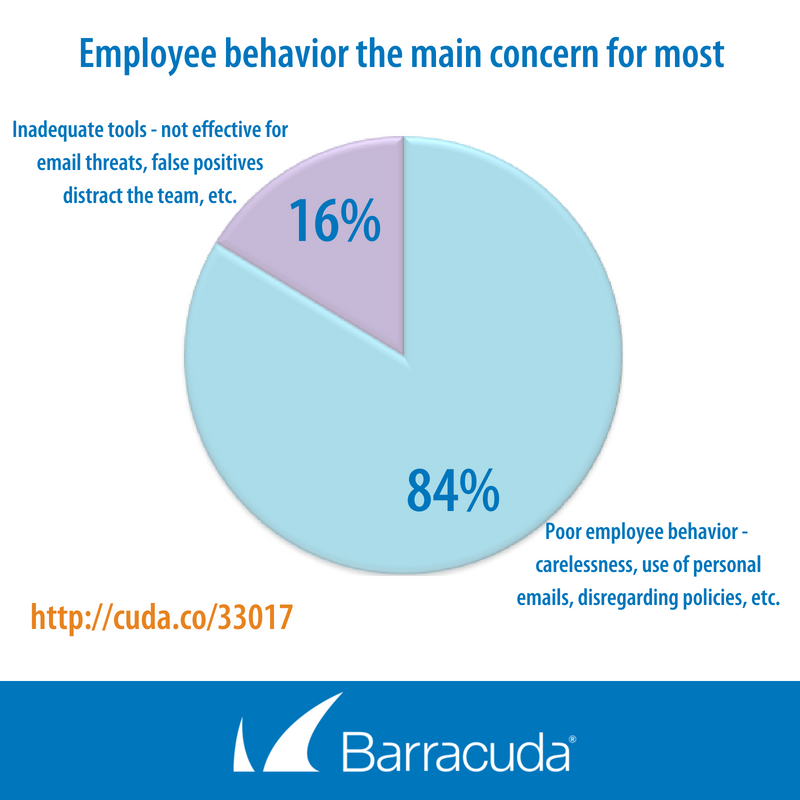 This data supports the notion that effective email security isn’t necessarily about the tools that organizations have in place to stop threats, but rather that poor employee behavior is a much greater cause for concern. This has always been the consensus, so it’s great to see the data back it up. Poor employee behavior was the top concern at 84%. Inadequate tools came in at 16%. This is a good example of how criminals are potentially balancing their attacks and not necessarily targeting any particular level of employee. Individual contributors were the top concern at 46%, with executives coming in at 39%, and team managers at 15%. Like with any scam, email security attacks are a numbers game. The more attempts made, the more likely someone will fall for one, and there are a lot more individual contributors available to attack than executives. However, the payoff could be larger if an executive falls for a social engineering attack due to the access they have to sensitive information. This is further proof that criminals are operating like a business—they are making good risk/reward decisions just like someone would when organizing a corporate strategy. As discussed above, this data supports the idea that executives are viewed as more likely to be targeted because of the access they have. However, the easier target may in fact be the frontline staff who aren’t always aware of the risks and impacts related to bad behavior. It’s no real surprise here that finance employees are viewed as the most vulnerable since they have access to the crown jewels, but we found it somewhat surprising that employees of legal departments were so far down the list because of the access they would typically have to important corporate information. 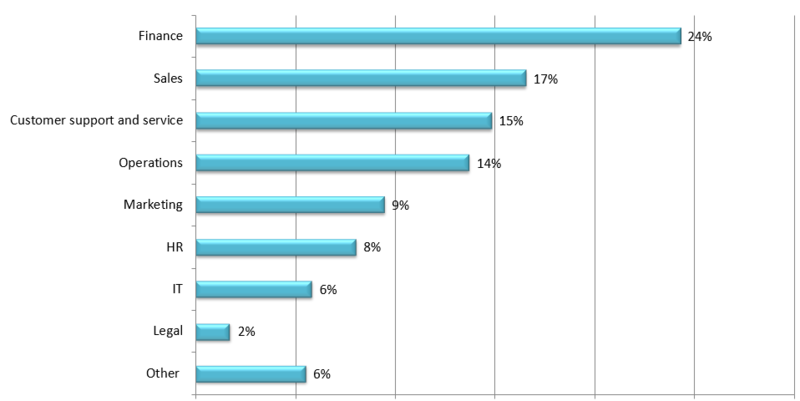 The following chart shows breakdown by department, with finance being the most worrisome for 24% of respondents. As far as who isn’t aware of the potential consequences of bad behavior—sales and customer support and services seemed to top the list. This could be for a number of reasons, but these teams are heavy communicators through email which opens up the door for attacks. 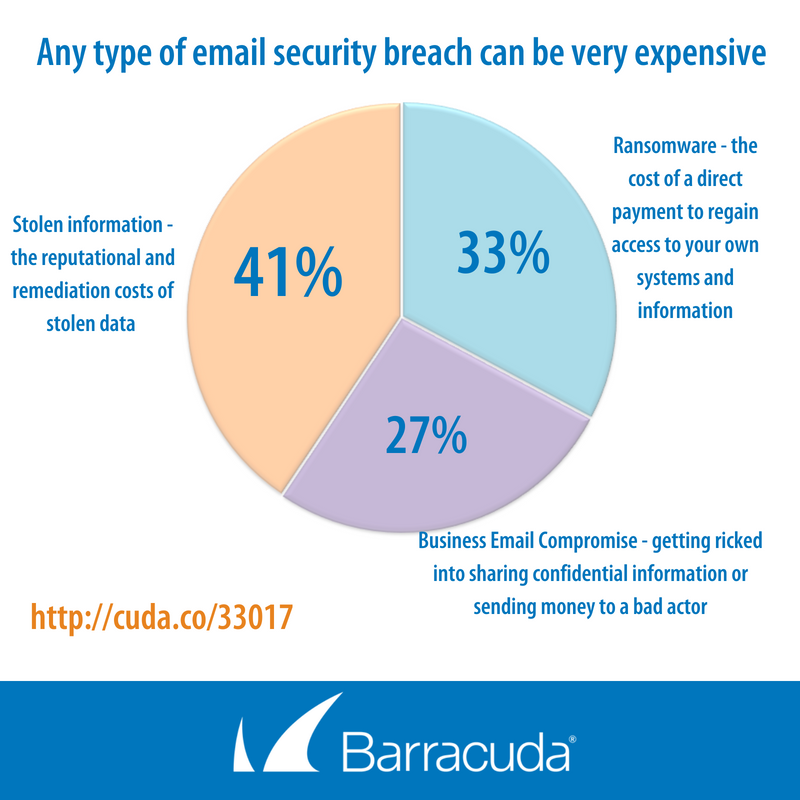 Based on the data presented here, there’s no real consensus in terms of which type of email security breach would be the most expensive. 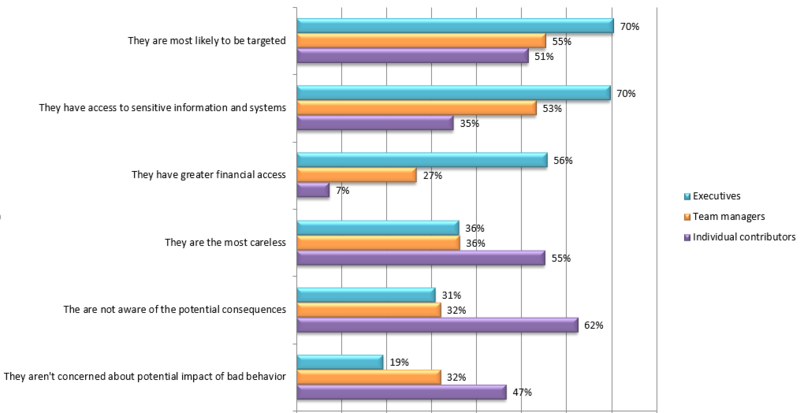 That question broke down as follows:: stolen information – 40%, ransomware – 33%, BEC – 27%. Information theft is the classic breach example; however, ransomware and BEC attacks are still fairly new and yet they have quickly closed the gap in terms of effectiveness. This shows that criminals now prefer direct monetization attacks over a traditional theft sale. One of the reasons worth noting could be that information theft requires a buyer for criminals to profit from, while these newer attacks do not—meaning less work for the criminals. Cutting out the middleman is no longer just an 80’s car commercial slogan. It’s great to see that folks recognize the importance of end-user training rather than just labeling it as a “nice to have” option. 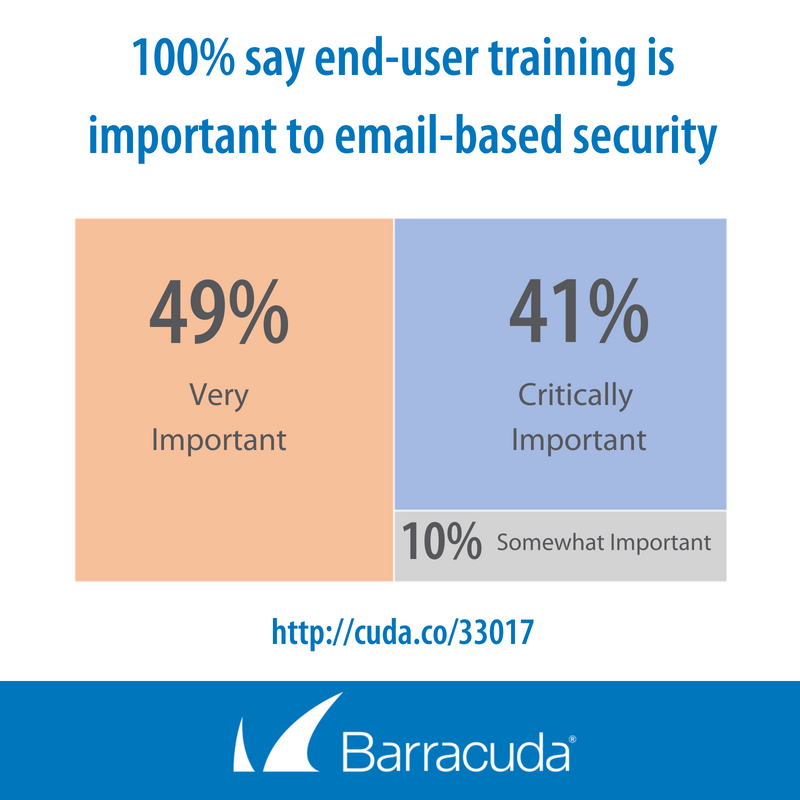 100% of respondents say end-user training is important. But, we’re also seeing that it’s important for organizations to offer users more than just a traditional classroom-style approach. Being able to scale training, move quickly, and be offered at the convenience of each employee could make all the difference in an effective program. Who is actually training their users? While we saw above that everyone thinks training is important, not everyone is doing something about it. 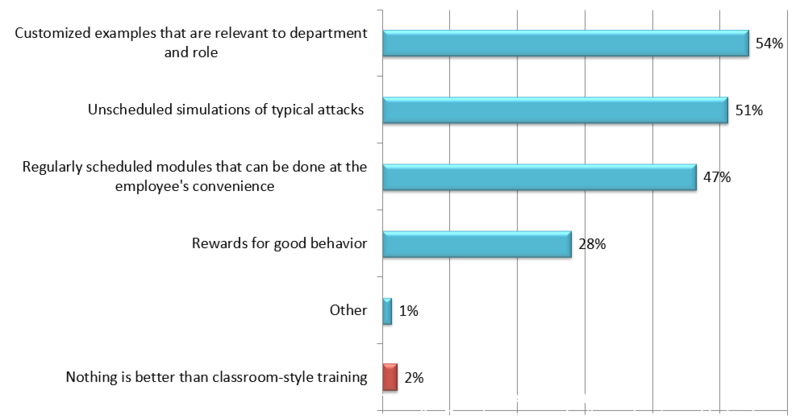 Although 100% of the respondents have good intentions, only 77% are actually training their employees. It also appears that the larger organizations (over 1000 employees) are more likely to implement training. This isn’t uncommon as enterprises are often early adopters of new business trends and technologies, but smaller organizations usually follow after new practices are proven. Lastly, the data shows that third-party training is in the cards for some (41%) for phishing and spear phishing training. That would mean that the remaining organizations are doing some form of in-house user training on their own. 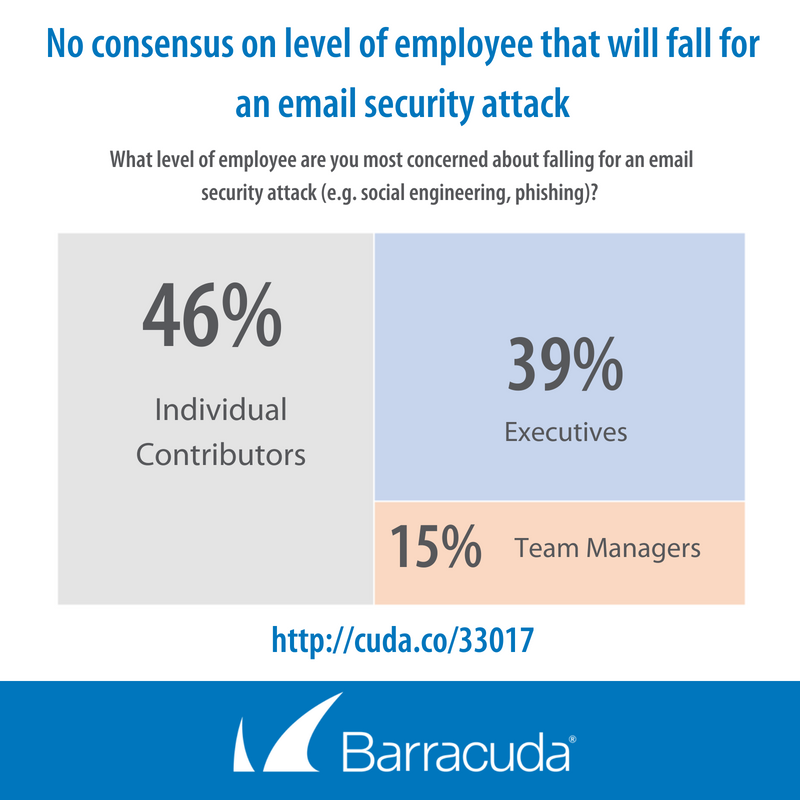 So, is end-user security training and awareness the missing link to your complete email security strategy? The data here suggests that it’s definitely a concern, and if you think about how many of today’s attacks launch—there’s almost always a human element involved. Links have to get clicked, attachments must be downloaded, or money has to get transferred by someone in order for these attacks to work. With that said, here are some quick resources in case you’d like to learn more about end-user security training.